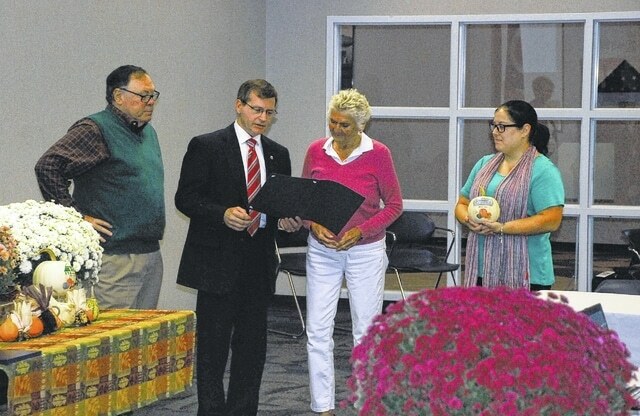 Champaign County Commissioner Steve Hess presents Lilli Ann Johnson, president of Johnson Welded Products (JWP), with a “Keeping Champaign County Strong” proclamation during Tuesday’s “Manufacturers Thank You Breakfast” hosted by the Champaign Economic Partnership (CEP) at the county Community Center in Urbana. From left are Urbana Mayor Bill Bean, Hess, Johnson and Rachel Lewis, CEP administrative assistant. During Tuesday’s “Manufacturers Thank You Breakfast,” the Champaign Economic Partnership presented representatives from Ultra-met, Johnson Welded Products and KTH with pumpkins painted by local artist Vicki Deere-Bunnell. Each pumpkin features the company’s year of establishment, logo and fall scenery. This year, all three companies are celebrating anniversaries (Ultra-met, 50 years; JWP, 45 years; and KTH, 30 years). Local manufacturers took center stage on Tuesday at the county Community Center during a “Manufacturers Thank You Breakfast” hosted by the Champaign Economic Partnership (CEP). “Almost everybody that is represented in this room on the manufacturing side has either had growth this past year – whether it be employees, expansion or new investment in equipment – or is getting ready to,” said CEP Economic Development Director Marcia Bailey. The list of manufacturing companies in the county includes Bundy Baking Solutions, WEIDMANN, KTH, Ultra-met, The Hall Company, Rosewood Machine and Tool Company (RMT), Advanced Technology Products (ATP), Sarica Manufacturing, ORBIS Corporation, Desmond-Stephan Manufacturing, Hughey & Phillips, Parker Trutec, Rittal, Johnson Welded Products (JWP), Robert Rothschild Farm, Colepak, International Fiber Corporation and Honeywell Aerospace. Bailey remarked that even with an ever-growing list of manufacturers in the county, no one is in stiff competition with the other and, in some cases, local companies are helping one another. Three local manufacturers were highlighted during the event for reaching anniversary milestones in 2015. “We thought it was unique that three companies are celebrating anniversaries all in the same year,” Bailey said. Representatives from the three companies were also presented with pumpkins from the CEP painted by local artist Vicki Deere-Bunnell. 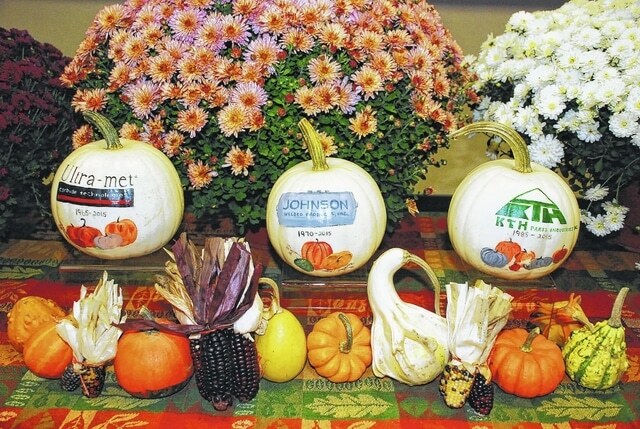 Each pumpkin was decorated with the company’s logo and fall scenes. Also in attendance was Sandra Brasington, the western Ohio regional liaison for Ohio Gov. John Kasich’s office, who presented each manufacturer with a proclamation signed by Kasich and Lt. Gov. Mary Taylor. Brasington also thanked the county’s manufacturers for “changing lives” for the thousands of workers they employ. Bailey presented data showing job creation is on the rise. In 2013, Champaign County manufacturers employed 2,928 people, and by 2014, the number rose to 3,487. As of September of this year, Bailey said, the number of employees working in the county’s manufacturing sector stands at 3,832. “We’ve had over 900 jobs created in a three-year time period just here in Champaign County in manufacturing,” she said.